Tea strainers or fine sieve, to clean seeds if you like to make work for yourself. 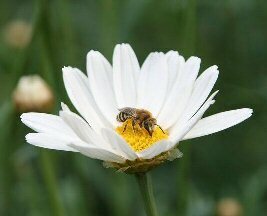 Any seed, wild or garden, which attracts bees and other insects will do. Harvest when it�s dry weather, about midday or afternoon. Collect ripe seed. The seed heads should be dry and yellow/brown. Poppy seed is obliging, you just turn its head upside down over the bag. Others you have to cut the seed pods off into the paper bag, then give a good shake or carefully cut open. Be sure to label. Leave somewhere to dry for a couple of days and then put into labelled envelopes, sealed at edges with masking tapes. These can be put into airtight containers or jars and placed in fridge till ready to sow. Don�t store in plastic bags. Annuals are usually sown in spring. They can be sown outside when danger of frost is past, or under cover and planted out when safe to do so. 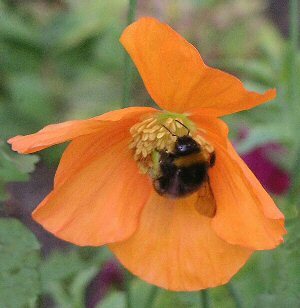 Hardy annuals can be sown outside in the autumn. This gives them a longer growing period so they will flower earlier. These are usually easy to germinate, and they may germinate a few days after sowing, and continue to grow through the winter, so that they are ready to flower as the weather warms up. Winter-sown annuals can be sown where they are to flower, or they can be sown in pots or trays to be put into their flowering positions in the spring. Because they are hardy plants, and will never have been kept in warmer conditions, they will not need 'hardening off'. Hardy perennials can be sown in spring, summer, autumn or winter. Some may need stratification (subjected to moist, cold conditions), so should be sown outside in the autumn. Some may take several seasons to germinate. Half-hardy perennials which are to be sown in heat may be sown at any time. If in doubt, check the websites below. A note of caution on sowing wild flower seeds from one of our members who has a vast knowledge on this subject. PLEASE ONLY SOW THESE IN YOUR GARDEN AND NEVER IN NATURAL AREAS LIKE WOODS AND FIELDS. That is because most wild flower seeds that you can buy come from different areas of Britain and even often from the continent. Those plants will be genetically different from the native plants in the Reading area and can cause problems. The result could mean the really native flora would suffer badly. It is possible to sow wildflower seeds directly outdoors onto a carefully prepared seed bed, or sow into trays of peat free seed compost. Place the trays outdoors in a cold glass house or under a sheet of glass as a substitute. Once the seeds have germinated, wait until they reach the `3 leaf` stage and then prick out into individual plant pots. Grow on into full plants before planting out into their permanent positions. If sown directly outdoors it is important that the seed bed is kept free of all unwanted weeds until the wildflowers are well established. No hard and fast rules when the seeds will germinate. However, some do need special treatment (stratification). Search on the web for specific instructions. Perennials need patience. They may not flower in the first year. The following varieties of wildflower seed should be sown directly outside onto soil and not in trays of compost :- Corn Poppy, Corn Marigold, Cornflower, Long Headed Poppy, Wild Pansy, Yellow Rattle, Sweet Cicely, Violet and Meadow Saxifrage. Yellow Rattle should always be sown together with seeds of grass on which it is a partial parasite. Wildflower seeds can generally be sown at any time of year, but best to avoid periods of drought or waterlogged conditions. Varieties requiring stratification are best sown in trays of seed compost in the autumn and placed outside for germination the following spring. Small wildflower seeds should be sown straight onto the surface of the soil or compost and left uncovered. Larger seeds should be covered with a light layer of compost or soil. For young gardeners and for novices. Interesting reading.